Take the mystery out of using off camera flash. 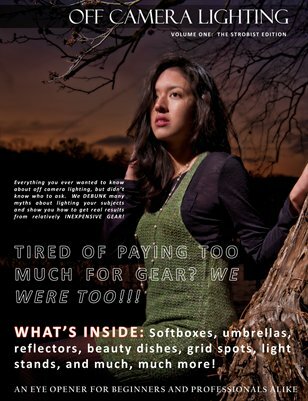 In this issue we'll explain everything you need to know about off camera lighting in a way that's easy to understand. If you're new to photography or a seasoned professional, this issue is a must have for any photographer who is interested in off camera lighting. We cover quality gear that doesn't cost a fortune. Chris also shares his past mistakes and lessons he's learned getting caught up in the latest "fad's" in lighting to help prevent you from making those same mistakes as well. This would be a great aid for any lighting instructor trying to teach people about off camera lighting as well. Everything is spelled out in black and white in easy to understand language for the beginner or advanced strobist.